i have a 7 month old chow chow who is neutered and has all of his shots. he is very adorable and very loving to strangers. he gets along very well with other dogs. however, he displays some aggression which is why i can't keep him. he needs a loving home and someone who will correct his behavior. he is housebroken, rarely barks, not hyper, and enjoys naps. if you have any questions about him, feel free to message me. What is the aggression problem he has? he shows typical chow behavior. he doesn't like to be reprimanded. he trusts me because i have been taking care of him for the last two months. however, there are times where he does get testy and turns his head to threaten to bite me. if someone else tells him to get off the counter or to stop doing something, sometimes he growls or tries to bite them. he hasn't drawn blood but i don't know how to train him and can't afford a trainer. he doesn't really like getting his feet wiped and tried to bite my dad yesterday. two weeks ago, i had family at my place. i'm not sure if it was because there were a lot of people but he got aggressive at the end of the day. he looks like he wants to play by walking up to people. then he'll let you pet him. he tried to bite my mom and actually bit my boyfriend who the puppy is familiar with. i'm home in san francisco visiting from los angeles so i really need to find him a home. he's getting a lot of freedom here which is also leading to him being more stubborn and doing whatever he wants to do. actually, if someone wants him in any place between san francisco and los angeles, i could probably deliver him. Let us know how you go please, your boy is lovely & any problems can be worked out I'm sure. Being only 7 months old he is still a puppy. He probably thinks he is the dominant one and that's why he's acting like that. Have you tried "Nothing in life is free" with him? Basically he doesn't get anything (food, treat, etc) unless he does what you want him to do. It might help. Also, have you started basic obedience commands with him? Sit, down, stay? i have contacted rocket dog and he's going to visit a home tomorrow. yes, i have tried nothing in life is free. i have been given great advice from this forum so thank you to all of you. i just think that he's a little more than i can handle. wish me luck tomorrow. he's currently being a cute dog lying on his side and going to sleep. good night to all and i will let you know how tomorrow goes. 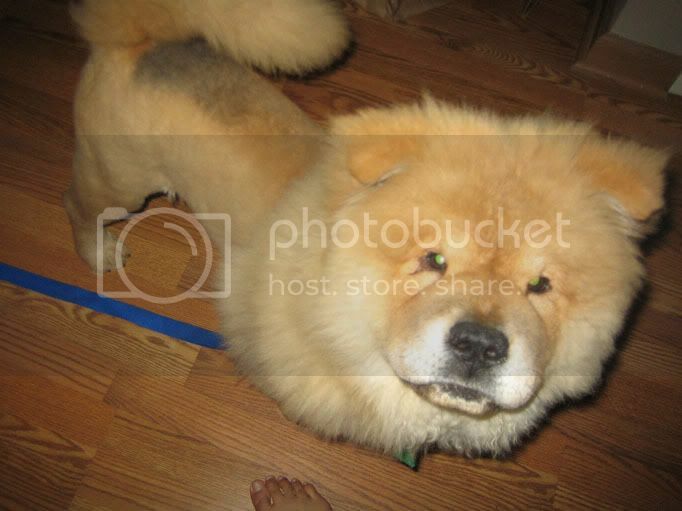 Hi, I am in the Bay Area and have one 11 yr old female chow. If you are still looking for a home for your 7 month old boy, please let me know. Bruin is with me now. If anyone is interested in adopting Bruin, please contact Jenn at Rocket Dog Rescue (rocketdogjenn@gmail.com) or via PM on cc.org as zingara_princepessa. Bruin is a really good boy! A typical 6-7 month old with all that energy - needs refresher courses on bite inhibition not food agressive. to Peidaan11 for taking him in the way she did and training him as much as she did. He'll be a GREAT adult chow for a chow savvy household. Oh that is good news! How is he doing? Laura wrote: ...How is he doing? He's sleeping. The three of them are sleeping! What a life - a chow's life! I'll wake them up in 15 minutes so they can run around the backyard. Lot's of chowling energy today in my tweeny corner of the world. awww... he and tigger are so cute together. i'm sure he's enjoying being at your house. he loves new places and sniffing around. i forgot to mention that he really likes bully sticks. he only likes the rawhide bone that is flattened so it can fit in his mouth better. i will go scan the documents tomorrow and email them to you and then send you a hard copy in the mail. I think so. We're a very treat happy home here. He's taken to a liking for Tiggy's wire crate and that is his "crib". There are lots of chew toys there too. His favorite is Tiggy's dinosaur nylabone. I just bought Tiggy a new one last week and Bruin has now adopted it (dino-bone is exactly the same as in my signature photo below - the one in Tiggy's mouth). Miss PB, the doyenne of all things chow in our home, is enjoying her little houseguest. She insisted Bruin take Tiggy's wire crate and make it his own so he feels at home. Tiggy has been relegated to the spare beach towel on the floor. For any potential adopters , everything Peidaan11 described previously about Bruin is true. Bruin is friendly with other dogs. Miss PB is 12-13 years old and the two are fine with each other and Bruin is very respectful. The tween chows are energetic. So, if you are hoping to introduce your tween with another, please realize the two will be a handful and I suggest a female companion would be best. I had a guest today, Leo's Mum, and Bruin was very polite with her. And listened quite well to Leo's Mum and was gentle when accepting treats. He does not appear to be food aggressive as I feed him with my hand in his bowl, nevermind the fact that my Mr. Naughty (Tigger) is right smack dab next to him. He walks well and enjoys them. However, since he is a tween chowling, it is important you have the ability to keep up with training him to be a good citizen. He will be a strong adult chow. He appears to prefer the "chillin'" inside the house versus being outside in the backyard. He has a very "easy-going" personality - quite low maintenance really. He also enjoys listening to music! He's rather affectionate and really likes giving what we call "purple kisses". Oh, and he snores when he's really pooped! Again, if anyone is interested in adopting Bruin, please contact Jenn at Rocket Dog Rescue (rocketdogjenn@gmail.com) or via PM on cc.org as zingara_princepessa. I had the pleasure of meeting Bruin today. He is such a sweet chow chow. The way he takes treats from your fingers, he knows how to be soft mouthed. As Lou mentions, he is not treat aggressive at all. With Tigger budging in to get his bit, Bruin was being very patient for his turn. I had to turn my back to him a few times as he got too excited w/ the treats and jumped on me(not in an aggressive manner), a bit like LEO. But after a few moments of tuning my back, he was sitting nicely for his treats. I have the same problem w/ LEO altho she does not get excited enough w/ us(known sods) but will get excited w/ non-family giving her treats. You just gotta ignore her for a while to get her calmed down. Bruin also has very soft fur especially around his head, just like LEO! 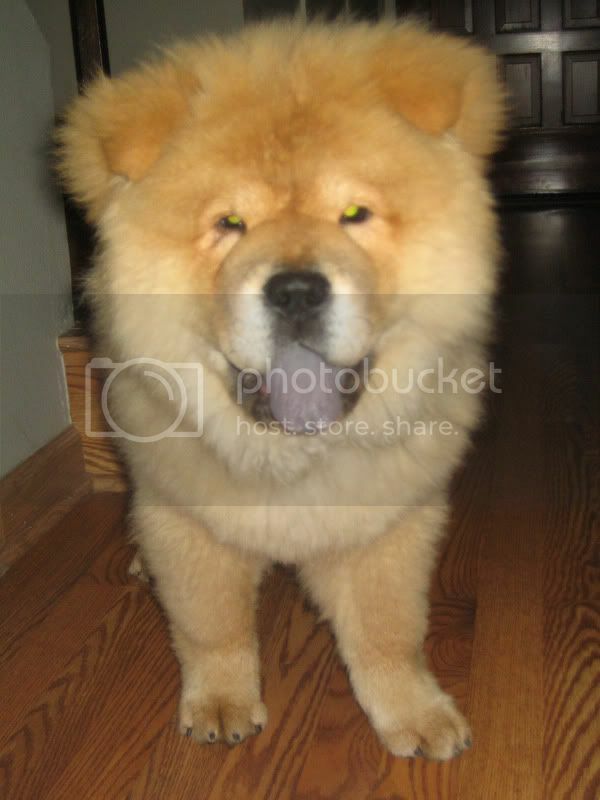 Such a lovely chow chow. I think someone w/ good chow experience could guide him to be a very good civilized chow chow gentleman. Aren't Tigg and Bruin the pair! Double Trouble. Miss PB must keep her domain with a firm..er..paw. Thank you for stepping in and helping. What's the update on Bruin? I just ran across his story. He's fine. He's with me. My duo like their houseguest alot. When out in the backyard, Tiggy is the Activities Director and Miss PB is the Recess Monitor. He'll probably be going to ChowFest next week! He really is a beautiful boy. You should see him when he sleeps... like an angel! He's a dream! Zhuyos mom wrote: He really is a beautiful boy. You should see him when he sleeps... like an angel! He's a dream! Bruin looks like such a sweet boy! And he gets along so nicely with your two - I bet they look like the three musketeers when they're all together! Shelly, Yes. I will try to bring Bruin to ChowFest. Cecilia, It's mainly the two boys who are joined to the hip. These two are real funny together. Miss PB honest to goodness is the big sister who makes sure the two boys don't get too rambuctious with one another. Bruin is really sweet. Tiggy is sweet too but he's naughty and he's mine. When Bruin meets his forever family they will be really fortunate! No. My two are gracious hosts. They like their houseguests to feel at home and comfortable. That is why Tiggy is the Activity Director (nevermind that he is "loco in the cabeza"/"crazy in the head") and Miss PB is all the rest and more. I, on the otherhand, can only keep 2 chows at home. Because I'm an "emergency chow foster", I need to be able to manage being able to take in an impromptu "houseguest". Bruin needs a forever home with someone who will give him all their love and attention. It's also something I promised Peidaan11 before she handed Bruin over to me and the rescue. He is a special fellow who has made far too many "bus stops" in his young life. Miss PB and Tiggy are more than happy to have him stay as long as it takes to find Bruin his own place to call home. I have a home for him, mine!! !